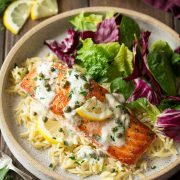 Salmon with Garlic Lemon Butter Sauce is one of the tastiest, easiest salmon recipes you’ll ever try! 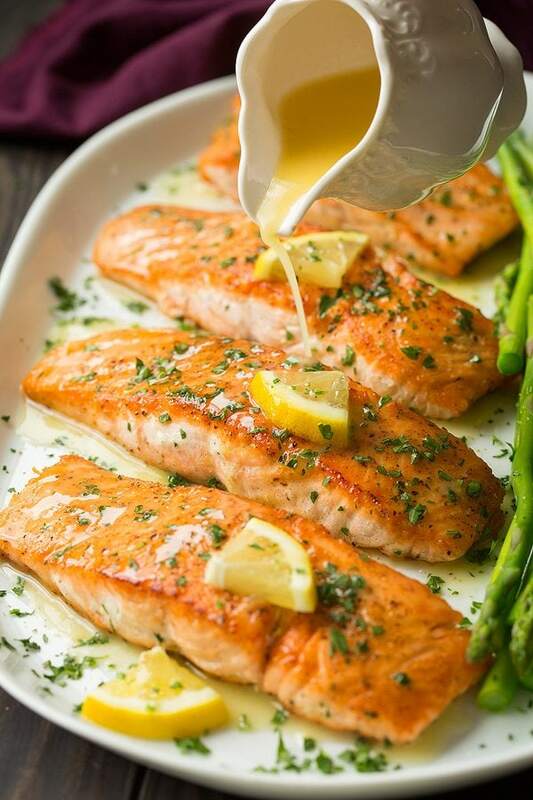 Tender salmon fillets are pan seared until perfectly golden brown then covered in a simple, vibrant and rich lemon butter sauce. A reader favorite! I love to sear salmon in a skillet because it yields a perfectly crisp seared exterior while the interior stays nice and tender. When you think there’s just no time for dinner, there’s always time to sear a salmon fillet and add a bright squeeze of lemon juice. But here we’ve got 5 extra minutes so I made this seriously delicious garlic butter lemon sauce. That saying the “the secret’s in the sauce” holds true on this one. It’s made up of 4 basic ingredients (garlic, butter, fresh lemon juice and chicken broth) and once you try it you’ll want to add it to everything. This salmon is a restaurant worthy dish that you can make in the comfort of your own home in 20 minutes! Recipe first shared Feb. 2017. Want to see how easy it is? Watch this Salmon Video. Salmon fillets – main ingredient. Rich in omega 3 and great source of protein! Salt and pepper – so the salmon isn’t bland. 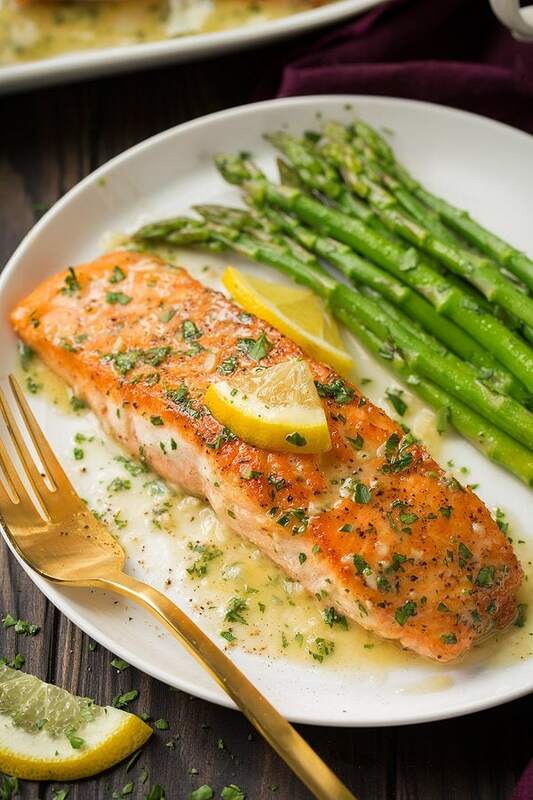 Olive oil – to help brown the salmon and prevent sticking. Chicken broth – to create a sauce. White wine will work great too. Fresh lemon – for bright flavor. It’s the perfect compliment to salmon. Garlic – for another layer of flavor. Honey – to balance out the tartness of the lemon. Parsley – for a nice colorful garnish. Let salmon rest at room temperature briefly, so it cooks evenly. Make the sauce – In a small saucepan melt 1 tsp butter over medium heat. Add garlic and saute 1 minute. Pour in chicken broth and lemon juice. Let sauce simmer until it has reduced by half, about 3 minutes. Stir in butter and honey, set sauce aside. Dab both sides of salmon dry with paper towels, season with salt and pepper. Add salmon and cook about 4 minutes on the first side until golden brown then flip and cooked through, about 2 – 3 minutes longer. 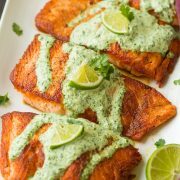 Plate salmon and drizzle each serving generously with butter sauce, sprinkle with parsley. Let salmon rest briefly before cooking so it cooks more evenly. 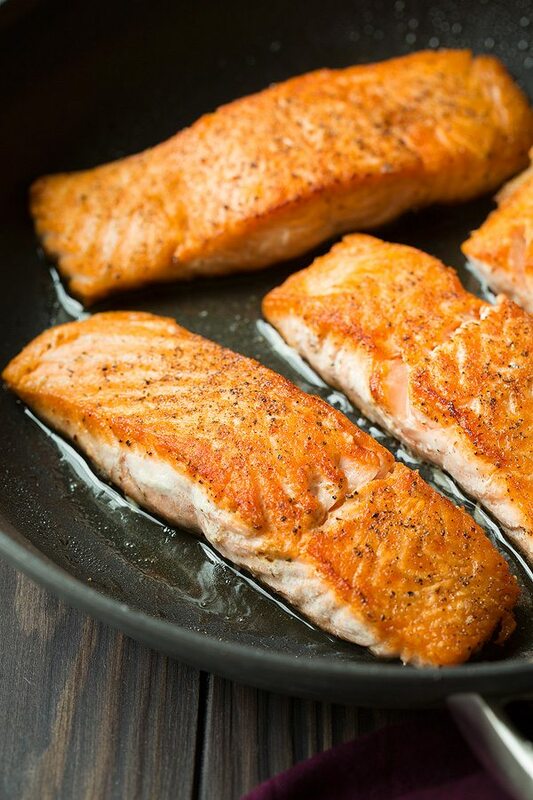 Preheat the pan and oil, this will help salmon brown better. Don’t add to a cold skillet. Dab salmon dry before adding to pan, this will give you better browning. Don’t move salmon as it cooks. Again better browning. Don’t over-cook it! Salmon should still look slightly pink in the center. Serve it with a sauce. Pan seared salmon is great on it it’s own but a sauce like this just takes it to a whole new level of delicious. What Should I Serve with This Salmon? I just served this with rice and steamed asparagus and it all came together perfectly (roasted vegetables, broccoli, potatoes, couscous, and quinoa are good choices too). If you want an even richer sauce you can add an extra tablespoon or two of butter here but I like to keep it on the healthier side so I kept it at a minimal 3 tablespoons (plus the teaspoon to saute the garlic) and it’s just enough. 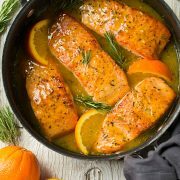 More Delicious Salmon Recipes to Try! 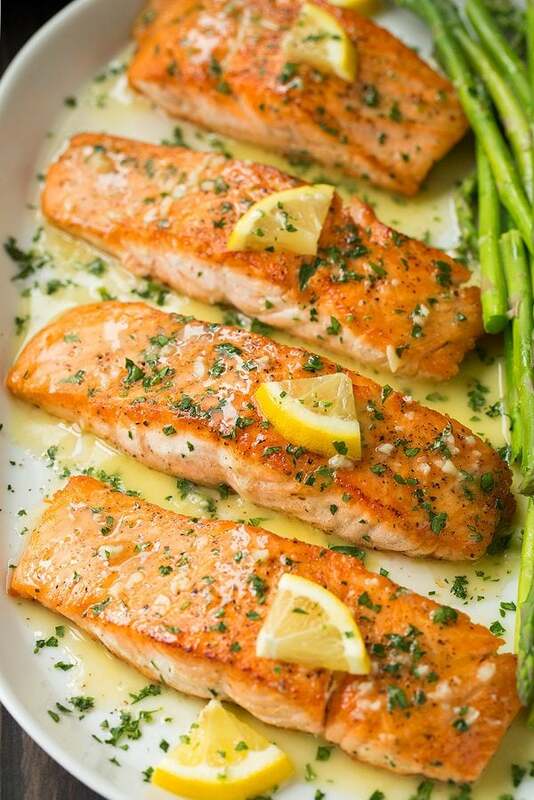 Remove salmon fillets from refrigerator and allow to rest at room temperature 10 minutes. Meanwhile prepared garlic lemon butter sauce. In a small saucepan melt 1 tsp butter over medium heat. Add garlic and saute until lightly golden brown, about 1 - 2 minutes. Pour in chicken broth and lemon juice. Let sauce simmer until it has reduced by half (to about 3 Tbsp), about 3 minutes. Stir in butter and honey and whisk until combined, set sauce aside. Dab both sides of salmon dry with paper towels, season both sides with salt and pepper. Heat olive oil in a (heavy) 12-inch non-stick skillet over medium-high heat. Once oil is shimmering add salmon and cook about 4 minutes on the first side until golden brown on bottom then flip and cook salmon on opposite side until salmon has cooked through, about 2 - 3 minutes longer. 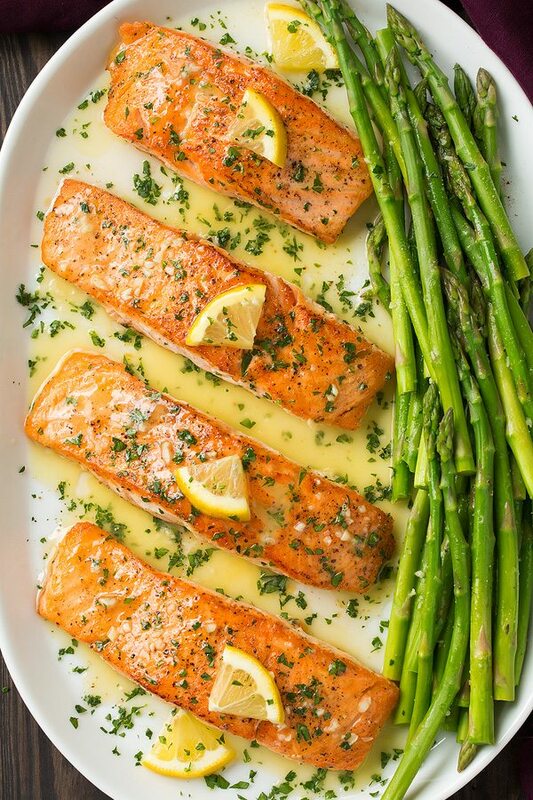 Plate salmon (leaving oil in pan) and drizzle each serving generously with butter sauce, sprinkle with parsley and garnish with lemon slices if desired. Serve immediately. Nana: Made this for a sweet couple in their 80’s tonight. They raved about it.